Lisa Joy Pruitt offers a new look at women's involvement in the mission movement, with a welcome focus on the often overlooked antebellum era. Most scholars have argued that the emergence of women as a dominant force in American Protestant missions in the late nineteenth century was an outgrowth of nascent feminist activism in the various denominations. This new contribution suggests that the feminization of the later mission movement actually stemmed in large part from images of the "degraded Oriental woman" that popular evangelical literature had been circulating since the 1790s and that the increasing focus on and involvement of women was supported by male denominational leaders as an important strategy for reaching the world with the Christian gospel. In the late eighteenth through the early nineteenth centuries, popular evangelical literature began circulating descriptions of women of the "Orient" designed to illustrate the need of those women for the Christian gospel. Such powerful and widely disseminated images demonstrated to young American women their relatively privileged position in society and, throughout the nineteenth century, led many to support the cause of missions with their money and sometimes their lives. A belief in the desperate need of "Oriental" women for salvation and social uplift was largely responsible for feminizing the American Protestant foreign mission movement. "A Looking-Glass for Ladies": American Protestant Women and the Orient in the Nineteenth Century traces the creation and dissemination of images of women who lived in that part of the world known to nineteenth–century Westerners as the "Orient." It examines the emotional power of those images to create sympathy in American women for their “sisters” in Asia. That sympathy catalyzed many evangelical women and men to argue for vocational roles for women, both married and single, in the mission movement. 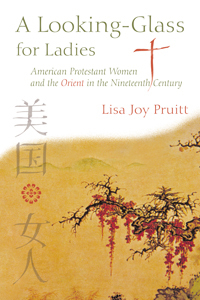 The book demonstrates the ways in which assumptions about the condition and needs of "Oriental" women shaped American evangelical women's self perceptions, as well as the evangelizing strategies of the missionaries and their sending agencies.